I came across this handy little site: Lastminute Auction. If you like flea markets and snooping for bargains then you will love this site. I know people like to buy all kind of cheap things, and this website can be really helpful. 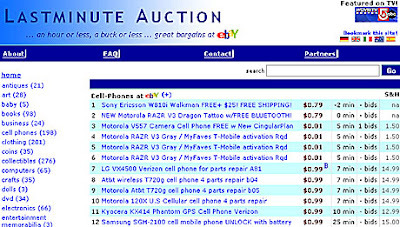 They list up to 20.000 ebay auctions (peak time is Sundays) at one dollar with just one hour left. There you will find things nobody wanted or are just have been overlooked. You kind of have to spend some time on it, because there is also just tons of crab. But once in a while you will find a gem. Worth bookmarking.